Web services are leading to the use of more packaged software either as an internal service or an external service available over the Internet. These services, which will be connected together to create the information technology systems of the future, will require less custom software in our organizations and more creativity in the connections between the services. This book begins with a high-level example of how an average person in an organization might interact with a service-oriented architecture. As the book progresses, more technical detail is added in a "peeling of the onion" approach. The leadership opportunities within these developing service-oriented architectures are also explained. At the end of the book there is a compendium or "pocket library" for software technology related to service-oriented architectures. 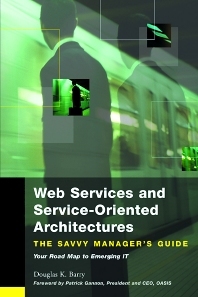 · Only web services book to cover both data management and software engineering perspectives, excellent resource for ALL members of IT teams · Jargon free, highly illustrated, with introduction that anyone can read that then leads into increasing technical detail · Provides a set of leadership principles and suggested application for using this technology. "The discussion on the common beliefs about enterprise architectures and how they relate to Web services is a gem and worth the price of the book. Similarly insightful chapters cover the impact of Web services on the enterprise, adoption steps and change management issues in implementing Web services projects. This a great book that every manager contemplating a Web services project should read." - Toufic Boubez, Ph.D., Author of "Building Web Services with Java: Making Sense of XML, SOAP, WSDL and UDDI"
Douglas K. Barry specializes in enterprise architecture with an emphasis in service-oriented architecture, database systems, and object technology, His practice is aimed at accelerating your understanding and use of software technology. He is an author, columnist, guest lecturer, international speaker, and mentor. Mr. Barry has consulted to over 80 companies operating in the areas of finance, stock trading, computer-aided design, telecommunications, electronic catalogs, software development, manufacturing, and military applications.